All of my books are currently 20% off! For those of you who have purchased any of my books already or are considering to, I wanted to give you a heads up that one of the product names you will see in the books is now different! 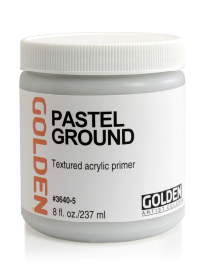 Golden Artist Colors, the fabulous company that I teach and lecture for, has updated the names on several of their products but the product has stayed the same. The one you will see in my books was called Acrylic Ground for Pastels and is now called Pastel Ground. For a full list of these changes, visit the Golden Artist Colors website!